On August 31st the Horns’ family life changed forever. That day, Martin (Marty) Horn was taking a surfing lesson in waist deep water, went into a wave and fell off the board hitting a sandbar. The impact immediately fractured his C3 thru T3 vertebrae. On September 5th, he had surgery to stabilize his neck, but unfortunately his paralysis appears to be permanent. He is paralyzed from his chest down, and can now breathe on his own after defying all odds. Marty is at the Shepherd Center in Atlanta Georgia. 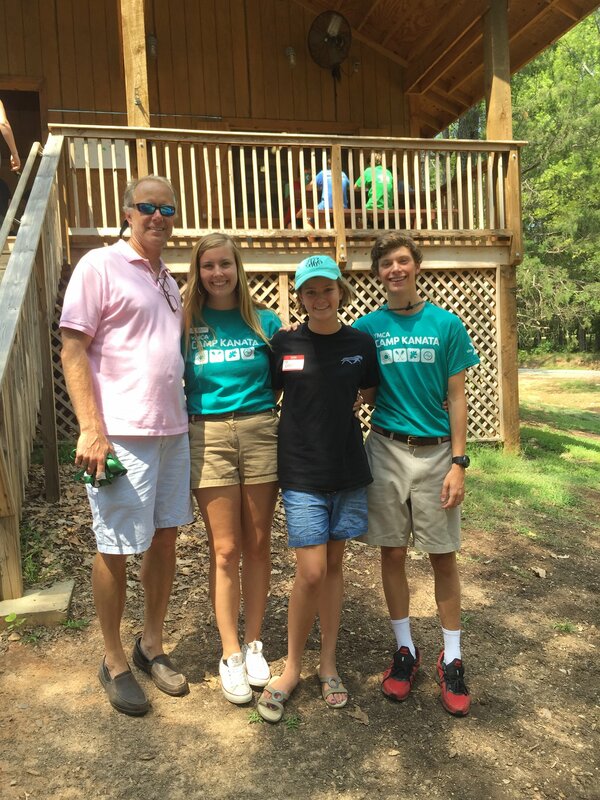 Marty has 3 children: Samantha (age 22) Senior at NCSU, Pearce (age 20) Sophomore at ECU, and Zoey (age 13) is an 8th Grader in Middle School. At present, Sam is acting as her father’s, primary caregiver/guardian, making all of the decision for him. She was in her last semester at NCSU, but has now deferred to care of her father. We are so very proud of her. After a life spent of enjoying the outdoors, triathlons, and a career as an attorney, Marty now faces a future with many obstacles and long road to recovery. As you can image the medical and rehabilitation bills alone will be astronomical. Research has shown that the estimated first year for a SCI is around $800,000 to well over $1,000,000. As many of you know Marty is a giving and prideful man. I cannot ever remember a time hearing him ask for help. I know of multiple families and clients he has financially helped out, and I am sure there are even more that I do not know about. It is time for us to help Marty in his time of need. Marty and his family have faith and know miracles can happen. Marty is strong and a fighter. Everyone has been amazingly supportive to the Horn Family since this tragic accident. Please continue to have Marty and his family in your thoughts and prayers. Family and friends of Martin Horn are raising money to pay for uninsured medical expenses associated with Catastrophic Injury. Martin has chosen to fundraise with Help Hope Live in part because Help Hope Live assures fiscal accountability of funds raised and tax deductibility to the full extent allowed by law for donors. Donors can be sure that funds donated will be used only to pay or reimburse medically-related expenses. To make a tax-deductible donation to this fundraising campaign, click on the Donate Now button. Thank for your support and prayers for Marty! They are greatly appreciated. Today was graduation!!! Wahoo, after 105 days being hospitalized Dad is finally ready to go home. I say home, but in reality he is not going to his home. He is going back to where he grew up in Oklahoma. I have been calling it home when talking about this move, but today he told me home is where the three kids are and where he has raised us for the past 22 years. We are hoping and praying to find a way to get him home (NC), but for now he will be in Oklahoma for a couple of months. This will provide him the best care for the time being. Dad has come a LONNNNG way since the accident. We did not even know if he would make it out of the ICU for the first couple of weeks. Dad came to the Shepherd Center looking rough. He can now sit in his chair all day and actually smiles while doing this! The last week he has been making jokes and talking much louder, I have really missed that! I am so tired. I look in the mirror and don’t even recognize myself. I cannot even put in my contacts because my eyes are so heavy. I have been with Dad for at least 15 hours a day the past 95 days. I am glad I got to be the person that was with him everyday, but in reality there is no one else that could have taken 3 months off of their lives. It is hard not seeing Dad with the results that we want to see, but important to know that he really has come a long way. Now that Dad is medically stable we are trying to really step up his therapy once he is back in OKC. 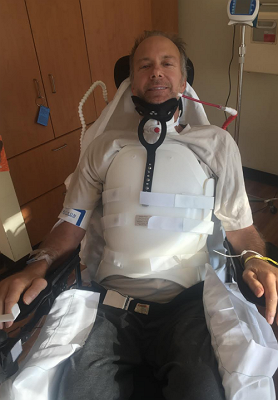 He had a lot of obstacles at the Shepherd Center including his open airway, giant body brace, blood pressure, shoulder subluxation, and Stage 3 sacrum sore. Now that he does not have the trachea or brace, and the other problems are diminishing he can really focus on physical and occupational therapy. I for one cannot believe they are just letting me leave tomorrow with Dad – LOL! I have learned more the past few months than I have learned my entire college career. We will be leaving Atlanta tomorrow at 1:48pm and arriving in Oklahoma at 3:09pm. I am not going to lie tomorrow is going to be a hard and overwhelming day for Dad. It is going to be his first time in a van or plane since the accident. Also the first time he is going for more than a few hours without the comfort of medical staff. His loaner chair is a manual chair, so I will have to push him at the airport along with handling our 7 bags. (4 bags of medial supplies!!) Debbie (Dad’s sister) and Mike (Dad’s brother) will be picking us up and taking us to Grandma’s house for a low key rest of the day. At this time we are requesting NO visitors. Dad will need a little time to get adjusted and into a routine. He would love the opportunity to plan visits with everyone wanting to come too! It will be really important to give him this control and independence so if you are wanting to give him a visit (or even take him out for a couple of hours) feel free to shoot him a text 919-801-3393. Debbie will be taking the main role as the caregiver for the next couple of months as well. We will have his other brothers and sisters stepping in, and potentially home health assistance. Please pray for tomorrow and this transition. It is going to be very hard for Dad and I both to have someone else do what I have been doing all this time. The surgery was a success, thank you for all of the prayers!!!! Dad just arrived back “home” to this room in the Shepherd Center after being in recovery at Piedmont Hospital. He is resting now and should be good to start back doing his other therapies tomorrow! The surgery was planned to be at 5:15 pm tonight but just got switched to right now!!! We are in pre op right now and the surgeries are being done at Piedmont Hospital. It is connected to the Shepherd Center. The surgeries should last about 2 hours and I will update everyone when we know more!! It is our last full week at the Shepherd Center, can you believe it?? This has been an incredible journey, and it feels strange that this part of the chapter is coming to an end. Our projected discharge date is 12/6/2017. Dad and I have been hoping he would be able to go to the Shepherd’s Day Program, but the therapists have suggested giving him a little more time to wait for some of his muscles to hopefully come back. 12/6/17 – Discharge date! We will be going to Oklahoma to stay with Dad’s Mom and sister (Debbie) for 1 – 3 months. Dad and I will be flying commercially to Oklahoma as long as he gets cleared by his doctor because of blood pressure concerns. 12/7-8/17 – I will be training Debbie on caregiving for Dad. 12/8/17 – I will be leaving OKC to return to the 5K in Durham on 12/9. It is really important to me to make sure I am there. I have not been back into town since the accident and would love to be reunited with friends to thank everyone for all of their support. 12/10/17 – I will return to OKC for a couple of weeks to help and teach more about Dad’s care. This has taken me 3 months to learn everything and Dad & I both have concerns about me being so far away. We have not booked any tickets yet or figured out my travel plans but I will update everyone when we know!! This week is a SUPER busy and exciting week for Dad as well. Tomorrow Dad has surgery. He has decided to get surgery for a colostomy bag and super pubic tube. This will give him much more freedom with his bladder and bowel program. I know he is nervous, but I hope he soon realizes the benefits it is providing. The surgeries are both done at the same time and can be reversible. Depending on how Dad does with his breathing the trach should come out Wednesday!!!! This is a HUGE miracle as we all know we thought he would have the ventilator forever. I am so proud of him. As long as breathing does good after the surgery he is good to go for the removal. Today he got his x-rays done to get his body brace off too! This is another thing that will *hopefully* happen Wednesday. Some things are a little slow these days as well all know. Thursday is a big outing to the airport!!! We will practice going through security, transferring to their chairs, and getting onto the planes. We will have the assistance of his recreational therapist and physical therapist. This will be a good practice run for next week. Also somewhat of a bummer on my personal life, but my sub-leaser has backed out three days before she was supposed to move in. I have used all my money to pay rent the past few months so even with me being at State next semester living in my house by campus is not a very realistic idea. Does anyone know any female student looking to live by NCSU campus?? Please spread the word if possible!!! Thank you 🙂 I also wanted to clarify I will be staying with my Mom in Durham. I only have classes on Monday and Wednesday so I am all taken care of. Thank you all for opening up your homes to me. I know we will be busy this week, but my Dad has loved getting cards and messages for everyone!! It takes him awhile to respond, but he is still working on texting everyone back from Thanksgiving. Also thank you all who have made it possible for me to be here. The help with gas and food has been more than appreciated and now that we have a “push pass” makes it possible for me to take Dad out to eat. Please pray for the surgery tomorrow!!! I hope that everyone had a wonderful day yesterday with loved ones. We sure did. Suzette, Bryan, Matthew, and Pearce have been in town the past few days and we have loved it! Last night we went out to Ted Montanas for a Thanksgiving meal. It is about a block away from the Shephard Center, so Dad was able to go there in his chair. We also had the pleasure of having Jake and Crystal join us. Jake is another patient down the hall who is on Dad’s “team”. Crystal is his wife. Dad only had therapy in the morning yesterday and was able to make it on the tilt table!!!! The past week his blood pressure has not been stable at all so we were thrilled when his therapist allowed it yesterday. He got to about 60 degrees. Once he is at 70 for 10 minutes he will be allowed to get on the loco mat. Thank you to everyone who texted my Dad yesterday. He LOVED seeing all of them and is slowly responding. Everything these days is just in a slower pace, but I promise he did enjoy seeing all of those messages!!!! My heart is full. I got to spend Thanksgiving with my loved ones. Although lately this has been hard for me, I do know that I have so many blessings surrounding my father and family. Sorry for the lack of updates lately, things have been pretty stable. Blood pressure problems have continued to hold Dad back a little, but he is working hard in therapy. Wow what a week it has been. Lots and lots of progress and big things happening. First of all Dad’s Mom was here Saturday – Thursday and Jill and Zoey gave us a surprise visit Wednesday – Friday! We are so lucky to have such a wonderful family providing so much support and love. I finished my respiratory training on Friday, so we are now allowed to be anywhere in the Shepherd Center! Saturday he got to enjoy his first meal at the cafeteria downstairs and be able to sit at a table and eat with Grandma and I. Such a small thing that most of us take for granted. The chance to sit down after a long day and eat with your loved ones. Something I will now never take for granted and appreciate the opportunity at every meal. Now Dad never wants to have a meal in his room again!! Tuesday was a big outing to Ikea. Dad’s first time into the community since the accident. He did a great job maneuvering with his wheelchair throughout the entire store and even got to buy a mirror so he doesn’t have to look at his phone to see how he looks. I got to drive Grandma and a couple other of the patient’s wives to Ikea so we could meet everyone and enjoy this special experience together. They even “challenged” Dad to look for some high tables that his chair would fit under that one day he could potentially purchase to have at home. Physical therapy and Occupational therapy has continued to progress this week as well. The next goal is to get Dad on the tilt table to get him strong enough for the loco mat. The tilt table is a table that they put him on laying down then slowly stand it up. Once he can be at 70 degrees for 10 minutes he will be in the clear for the loco mat. That will involve his legs going into “robot legs” and will make his legs walk on a treadmill. Right now Dad can get to about 45 degrees on the tilt table. His blood pressure goes down which could lead to him fainting. Everyday they work on this and getting him on the mat because it is so exhausting for his body just to be moved and into a new position. He even lifted up his right foot very slightly for Zoey and I yesterday!!!!! He has not been able to do it again, but we are praying for strength to repeat that movement. He is still freezing everywhere that we go! This is expected with a spinal cord injury, but we are really hoping this goes away soon. It is so hard on him and he is constantly needing a warm blanket. Dad also still has his trach. He has not needed to be suctioned often, but is having trouble sleeping so they will not take it out yet unfortunately. We are actively looking for a solution about this because it will be very hard on him to have that for a long time and also make it harder finding a care provider. Thursday we had a meeting with a potential wheelchair vender to fit Dad for his very own chair!! Very exciting and many decisions to make on that. They will be giving us quotes on Monday so stay tuned! Yesterday and today Kady (RT) and Jordon (PT) took Zoey and I outside with Dad. We practiced crossing the busy streets of Atlanta with him and I am now cleared for a push pass!!! This means that Dad and I can now leave the Shepherd Center. We can go anywhere within walking distance and there are many restaurants within this distance. He has not chosen where he wants to go, but his is a HUGE deal and we are so excited. First outing with no therapist! Next week we are going to work on a day pass which means working on car transportation and other care needed for extended periods of time. Overall a great week full of progress, outings, and new friends. We have been able to eat meals in the cafeteria with the other guys on Dad’s team and even got to go to a rugby tournament today. Please pray for movement, removal of the trach, and peace. Thank you for being a part of our journey!!!!! When Sam & I talked about doing a t-shirt Fundraiser, our original goal was to sell 50 shirts and raise at least $1000. Wow, we double our goal by selling a total of 107 shirts and raised $2010!!!!! Thank you so much for purchasing a shirt to show your support for Marty and his family while he is recovering. At first this fundraiser was to help get Marty to Rehab, but as most of you know due to some wonderful people donating the funds needed to get him there, this money will now be used to help purchase him a wheelchair. Remember once you get your shirt please make sure to take a picture of you wearing it either post by using #teammarty on Facebook or Instagam and tag Marty or Sam, or send Sam a picture to [email protected] If you are on Facebook a TeamMarty page has been created to keep everyone up to date on events. Again the family cannot thank you enough for all your support and generosity during this time of need. Please continue to keep them in your prayers. The last couple of days have been so busy, but we are both getting used to that now. Today Dad was officially put on normal diet, we celebrated with some Chipotle!! He also made some big strides in physical and occupational therapy today!! Dad was able to move his right AND left foot slightly. Tonight he also moved his right thumb on command for nurse Jenn!!! We are so excited for this huge miracle and hopeful for more movement. Dad has been having some trouble regulating his temperature, which is normal for a spinal cord injury. He usually has on multiple blankets, but this has not been helping because he feels like the coldness is coming from inside. We talked with the doctor about it as well as some other patients and mentors and this is expected to get better. Right now it does cause for some discomfort thought. His right shoulder has shoulder subluxation. This is from his arms weighing him down for the past couple of months. Tomorrow Jordan (PT) and Emma (OT) will be wrapping it in order for it to hopefully get back in place. Prayer Requests: Peaceful sleeping, continued confidence, for the swelling to keep going down, temperature comfort, and shoulder healing. Our original goal was to sell 50 t-shirts and now we are only 13 away from 100!!! Please help us reach this by tomorrow and send me a pic once your shirt is here. We are so thankful to have you on this journey with us and every night I read Dad the comments off of here!! Thank you, thank you!! Such simple words, but filled with so much love and gratitude! Marty is working hard at the Shepherd Center and we hope to have him in OKC in time for Christmas where he will continue rehab. As you know all of this “moving” to find him the best care does not come cheaply and without sacrifices made by his family, but that is love in action. I want to make sure that everyone feels the love that is given from the whole Horn family for all of your prayers and donations to help Marty. So many of you have sacrificed to send funds through this campaign. You have been angles to all of us in our time of need and all of our efforts are made to help Marty have the best life possible. We know God has big plans for Martin and we have already seen HIM work in Marty and through others during the last 2 months. Final reminder that tomorrow is the last day to buy #teammarty t-shirt! Marty would love to see your selfie with your t-shirt on supporting him!! Click on the T-Shirt Sale link on this campaign page to get a shrit. Today was f fun filled day at the Shepherd Center. Dad’s whole team (all the therapists and 9 other patients) dressed up as magic 8 balls and did some fun Halloween activities together. We all went to the haunted house, which was actually SO scary. It was located in the 4th floor therapy gym and the theme was ‘Shepherd Prom’. I helped DAD navigate with his wheelchair because there were some tight corners and dark areas. After the haunted house everyone played Bingo and Halloween trivia. Dad was pretty good at trivia and won a couple of rounds! This afternoon Dad was able to get a long awaited hair cut too – YAY! Physical therapy this week has really been focusing on having Dad drive the wheelchair himself. This is done by a sip and puff method. He can do a hard sip, soft sip, hard puff, soft puff. He is really getting the hang of it, but is still a little slow. Occupational therapy this week has been focusing on range of motion. His shoulders are a little out of place so they are really working on strengthening them because he is able to move his shoulders and does shoulder shrugs as an exercise. Today Jess the speech pathologist cleared Dad for a normal diet!!! He is not quite ready personally though because he does feel uneasy eating in his brace. He is going to stay on Level 3 for a little bit longer, but when he is ready he will be moved to a regular diet! This is huge news – just about 4 weeks ago Dad was telling me how he would never be able to eat real food again. His feeding tube has been off for about 4 days now. His right lung is having some issues currently. They have actively been doing x-rays and trying different breathing treatments, but still nothing has helped. The bed sore on his sacrum has gotten a little better, but it is very important for this to continue, so that Dad does not need surgery later on. Please continue to pray for Dad and especially pray for: continued confidence, a stronger cough to clear his lungs, and healing of his bed sore! Oh and one more thing!! The tshirt sale is over on Friday if anyone else wants to get one!! Once your shirt is delivered please send me a picture of you wearing it and I will hang it up in Dad’s room!! Debbie (Dad’s oldest sister) is reading to him so I finally have some time to write a post to update everyone! It has been a very busy week at the Shepherd Center and it is such a wonderful place. Monday – Friday Dad has physical therapy, occupational therapy, and respiratory therapy treatments. Twice a week he has individual counseling, speech therapy, recreational therapy, chaplain visits, and group support. Saturday mornings are shortened occupational therapy sessions. Jordan is the PT, Emma is the OT, Dr. Bilsky is the doctor on Dad’s side of the floor, Dr. R is the psychologist, Barb is the case manager, Macy is the dietician, and Jess is his speech therapist. Dad has a huge team here ready to help him fulfill his potential!! This week has bee a tough one though. Wednesday was the first time in a wheelchair for more than an hour and by Friday Dad was in the chair almost all day. Sitting up in a chair is strenuous, because of all the time he has spent laying down in a hospital bed. This new environment is a big change for the both of us. At New Hanover Regional Medical Center, Dad and I had a pretty normal and set daily routine, so this has been a hard adjustment. This is a situation where it just is not realistic to think that Dad can be positive 100% of the time, but he is working hard to keep an optimistic outlook. There are some great guys on Dad’s floor in similar circumstances, so it has been really nice for him to get to know them as well. What is really awesome is that the Shepherd Center is a rehabilitation hospital. They have been very clear with Dad that he is too healthy to be in a normal hospital, he is not sick. He has some physical obstacles with breathing and his blood pressure, but his quadriplegia does not mean that he is sick. Of course, we are hoping and praying for a miracle and the swelling to go down in his spine, but there is no way to gauge the progress he will be able to make so early in his recovery. The Shepherd Center is a very family oriented, which we both love. They have been actively teaching me how to care for Dad and his needs, so that soon (hopefully next week) I will be cleared to do the bed transfers alone and we will be able to roam around the Shepard Center just the two of us! This is something that Dad is really looking forward to and so am I! And yes for everyone wondering I will be here at the Shepherd Center as long as Dad is here and other family will be in and out as well. They are estimating he will be here about 6 weeks. We had a lovely visit this week with Debbie and she was able to learn a lot too about Dad’s care needs. Being here will be the best thing for my father and I am so excited and happy we could give him this opportunity. Please continue to keep Dad in your prayers and I am sure he would love cards, jokes, pictures, room decorations anything to add to our new temporary home!!! Made it to the Shepherd Center, everyone is great down in Atlanta. I am beginning my road to recovery, thank you for all the well wishes! I will update everyone with some more details as soon as I get a little more time! Mandy Horn here, I am Marty’s sister in law. Mitch (Marty’s youngest brother) and myself were able to spend a long weekend in Wilmington with Marty, Samantha, and Pearce. We were incredibly lucky to be there, when Marty had a big week. It has been a long 7 weeks but he is making steady progress with his eating, talking, and breathing on his own!! Not only is he off the ventilator, but Thursday was the first day he was strong enough to be put in a special wheelchair and be rolled around the hospital. All he wanted to do was go outside and go back to the ICU to see and thank all of his nurses!! Later, was a request of some BBQ and Banana Pudding from Smithfield’s for his dinner! And what a way to finish his time at New Hanover Regional Medical Center! Can’t say thank you enough to the care providers there, and it was obvious that Marty is their favorite patient! The next step is rehab and onto the next phase of his journey, where miracles are possible! Marty and Samantha were transported yesterday to the Shepherd Center in Atlanta, GA via Angel Flight. I am happy to report that they are settled in to their new home for the next 45 days. Please join us in praying for continued progress, comfort, and support. Omg I am so proud of my dad!! He has been in the hospital for exactly 7 weeks and today was the first day he was strong enough to be put in a special wheelchair and be rolled around the hospital. 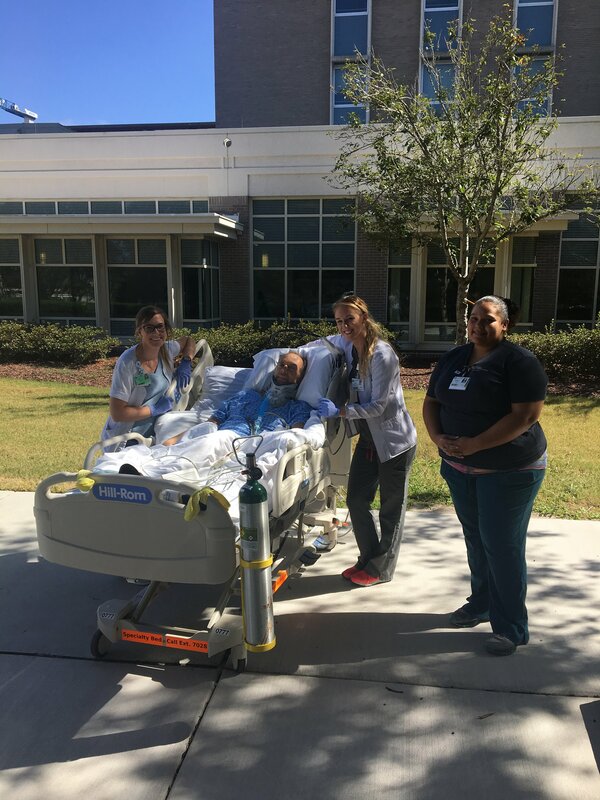 All he wanted to do was go outside and go back to the ICU to see and thank all of his nurses!! It has been a long 7 weeks but he is making slow and steady process with his eating, talking, and breathing on his own!! Our next step is rehab!! Please consider getting a #teammarty tshirt to help and show support!!! Yesterday started the week off on such an amazing note. Now that dad has had the vent out of his room since Thursday, they were able to downsize his trach. This is a small bedside procedure in which they just switch out his trach for a smaller one. Now that he has a “6” trach, he was able to get a speaking valve. After 47 days of not being able to speak, he was able to take to me!!!! His voice was faint, but we could actually have a conversation. Through many tears and laughs I got a part back of my dad that I have not had in what feels like forever. We were the able to call Pearce, Zoey, his Mom, and all of his brothers and sisters. Days like yesterday are what makes spending every day here worth it. Most days are not this good, but on the worse days I think of how amazing it is to share the good days with my father. The rehabilitation specialist came in shortly after and assessed Dad’s paralysis. Dad was able to move right foot’s toes on command for him. This is HUGE! The progress that my father has made in a short 7 weeks is giving the doctors a lot of hope. They cannot give us any answers about more movement, but they are hopeful in the miracles that have already started to show. The next step of our big day was a swallow test!! Dad passed the first part that included water, ice chips, and pudding. (I have been sneaking him some ice chips the last couple of weeks and he has been doing just fine 🙂 ). They then had to schedule a scoping procedure to make sure he was doing as well as they thought he was and he passed! He can now start having liquids such as drinks, yogurt, pudding, and oatmeal!! The said he should be eating hamburger in no time. The first thing that he wanted was banana pudding and root beer! The recent progress he has made is progress we were originally told he would never make. It is incredible and shows the power of prayer. My dad wanted me to tell everyone thank you for the support and he loves hearing from everyone. Today has been a quiet day so far; he did not sleep well last night and is still overwhelmed by all the events of yesterday. Once again thank you for all the kind words and prayers. Our family could not do this without the support that we are receiving. In order to help the family raise money for Help Hope Live in honor of Marty, we have decided to sell t-shirts. Seeing friends and family from all over wearing a #teammarty shirt will help provide strength and encouragement to Marty and his family as they continue onto his next recovery journal. Thank you all who have prayed and shared gifts to get Marty the transportation and care!!!! Please know how humbled and thankful all of us are to have you with us on this journey! We had some lovely visits this weekend with friends and family-these are keeping his spirits up! He wants everyone to know how hard he is fighting 🙂 His room looks great without the vent!!!! On Friday, Oct 6th, Dad was able to stay off the vent for about 8.5 hours and getting on his brace for physical therapy has been getting a little easier for him and the therapists and nurses. On Saturday and Sunday Zoey, Pearce, and Jill were here! Dad was ecstatic to see his other two children. Jill and Zoey even brought decorations, so now he has the best room on the 7th floor  He was also able to do trach collar trials both days. Trach Collar trial is when they turn the ventilator off and he is breathing on his own. He did about 6 hours both days. On Monday, he did a full 12 hours of trach collar trial and was able to be sat up on the side of the bed for 20 minutes! This is the longest that they have been able to sit him up! Although the therapists are the ones sitting him up and holding him up, it is an exhausting process for him. Now that he can do 20 minutes, we are trying to get him into a chair because sitting on the side of the bed is not very exciting for him. Tuesday was a rough day; he was exhausted and not feeling well. He was supposed to do the trach collar trial for 24 hours, but was only able to do it for 2 hours. Lately he has had more good days than bad days. This is a huge improvement and big change because when he was in the ICU there were many more bad days than good days for him. Right now his three biggest concerns are his stage 2 bed sore, getting him off this vent, and addressing his PM medications. The bed sore has not made any changes in the last week and if it gets to be stage 4 that could mean surgery. The trach collar trials show that is diaphragm is working!!! After he does the trials he is incredibly sore, but just needs to continuously keeping up this progress. Nights are probably the hardest for my dad. It is really hard to stay asleep through the whole night so continued prayers for a peaceful rest are needed. The better he sleeps the better his days are. We are grateful for this campaign since it does go directly towards assisting in my father’s uninsured medical expenses. The needed costs we are facing right now; $125,000 upfront for rehab, $40,000 for a used handicap van, $3000 for a wheelchair and $2000 for a medical bed. Of course donations are not expected, only appreciated. My father should be going to rehab within the next couple of weeks. He has been stuck with me the last 6 weeks, so I am sure he would appreciate some fresh faces before leaving for rehab. Please contact me if you would like to visit. He loves everyone’s comments and well wishes, please continue sending them. She said, yesterday was honestly the best day they have had in the past five weeks. That morning the nurses and physical therapists had Marty’s body brace on, sat him up and propped him up for 15 minutes without the ventilator being on. 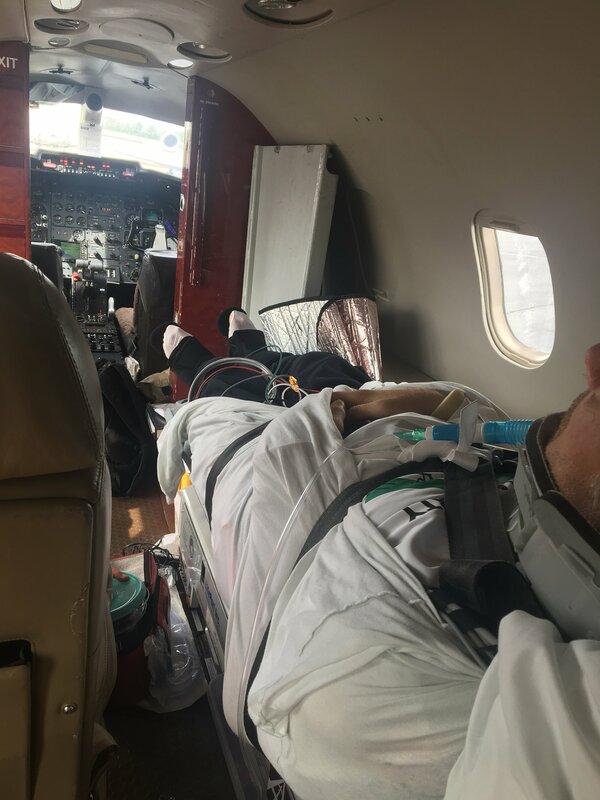 He has not been able to breathe on his own while being propped up throughout this entire journey. After physical therapy was over, the respiratory therapist came in and asked him if he wanted to go outside. Of course the answer was ‘Yes’. The respiratory therapist, nurse, nurse’s assistant, and Samantha rolled his bed outside under a big tree and listened to some country music and all were able to relax for about 45 minutes This was the first time that he was outside in 5 weeks, and he was breathing on his own the entire time! Sam said her Dad looked happier than he had in weeks. Once they got inside they hooked up his ventilator. Then, around 4pm they started him on another trach collar breathing trial and planned on turning the ventilator back on at 7pm. I'm sorry to hear this. Stay strong! Marty.. I just got the news about your accident!! I am so sorry !! If anyone can turn this"lemon" into lemon aid"...You can!! You were an excellent lawyer and I know you wil be an excellent patient! Keeping up with your family, I want to help some how. I live now in Clemson, SC and work as an Athletic Trainer. If you need some supplies, I may be able to get you something! Stay in touch, let me know if I can send anything! saying prayers! I am now a stay at home mom but my background is in nursing! I would be happy to help in anyway I can! It has been years, but you and Pearce were (are) so special to me when I watched you two as kids! Love to you and Marty! Thinking of you every day Marty. Keep fighting. You've already made so much more progress than they said you would. I know that you still have great things ahead of you! Marty I am so very very sorry for all you are going through. We all know you as a lawyer of compassion and strength. Wishing for you the ability to live with this new and grave challenge. God be with you and your family. So sorry to hear of this news & you’re in my thoughts & prayers! Sending encouragement & hugs your way!! The Lord is your strength and Your salvation. Let your spirit focus on HIM! We love you and are praying for you. “There” re my previous spelling typo!! Hey Marty thinking and praying for you every day!!! You were always one of the most effective attorneys out there and now I know you will achieve outstanding healing from this injury Marty. Come on back to court and whoop up on us some more. Sending prayers for your healing, friend. Marty, It's been too many years, but we wanted to wish you well! You raised an amazing daughter- no surprise to us. You are in our prayers. Best wishes for a speedy recovery, Go Pokes!!! Martin, We are keeping you in our prayers. Marty- You are in our thoughts and prayers daily, my friend. Sending much love to you and your entire family. Marty, our thoughts and prayers are with you. Our families have been connected since Millie and Ingrid babysat for y'all. You have helped us as our attorney above and beyond. Our turn to help you. Godspeed. Martin, prayers are being said on your behalf by people you don't even know. Please know I have confidence in our God!! He is still a healer! Get strong, stay strong!! Sounds like you have an excellent gal in charge!! Samantha is a keeper! I am also sending prayers for her. Hang in and hang on, you're a tough guy..you can do this!!! The Knights are on their way. Hang tough Marty. Marty, I am Mike Horn' s mother -in-law, don't hold that against me!! So sorry for all you have had to go through but hear you have a strong assistant names Samantha! Just Know me & alot if others are praying for you daily!!! !